It was clear the café needed more than pour-overs to survive, so the Rose began its foray into food by offering toast—either cinnamon sugar or avocado—made by baristas between drink orders. Eventually the toast menu evolved into salads and quinoa bowls, still prepared by the baristas between drink orders. “We kept growing and growing with what we were doing with food,” Kirkland says. This evolution included adding a convection oven and hiring someone to bake in-house; then, buying a decent commercial oven and hiring a bona fide pastry chef; and finally, bringing on Cori Norton, the café’s first food manager. Though Norton didn’t have a lot of training, she was confident she could improve the food prep workflow. “When I came on, it was taking them a week just to prep chili. Each task was assigned to a different day of the week, since baristas were still doing all the prep work,” Norton says. Norton managed the food and pastry programs at the Rose for a year and a half, eventually leaving to gain more experience in other professional kitchens around Salt Lake. 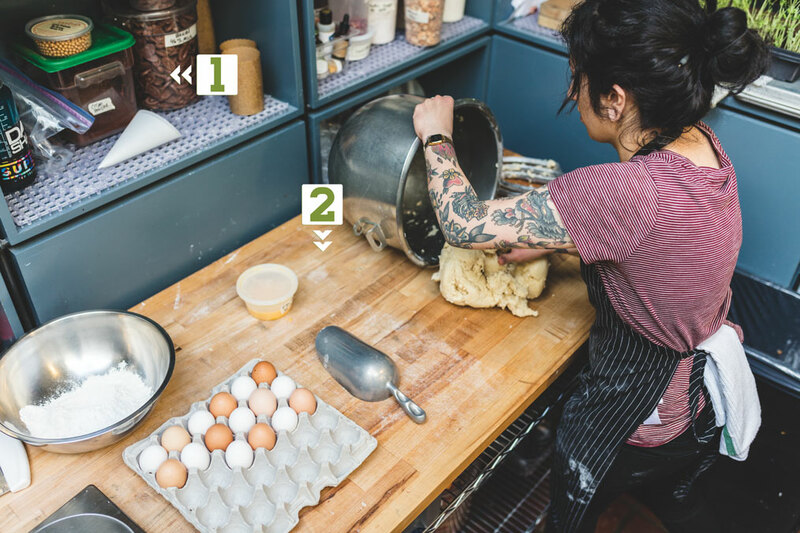 While working at Rye, she met Alicia Pacheco, a professionally trained pastry chef. Long story short: the two hit it off, Norton made her way back to the Rose, then Pacheco joined the staff in January of this year. Norton now works as the Rose’s chef and Pacheco runs the pastry program. In addition to an evolution of staff to position the right people with the right training, the Rose has also undergone several equipment and layout transitions. The most transformative of these was the addition of wooden, modular shelving. The adjustable shelves create a division between the kitchen work space and customer seating (a division that was not previously clear), and provide storage for both the front and back of house. Behind the wall of shelving, the bakery and food teams each have designated prep areas. The tight quarters can make it tough to find work space, so communication is key to ensuring everyone has the space and time to complete prep tasks. The tight quarters also have benefits, like encouraging cross-utilization of equipment and ingredients. 1) Cordoned Condiments: A bench and condiment station create a wall between two support beams, helping traffic flow toward the register. Positioning the condiments away from the pick-up area keeps customers from creating a bottleneck. 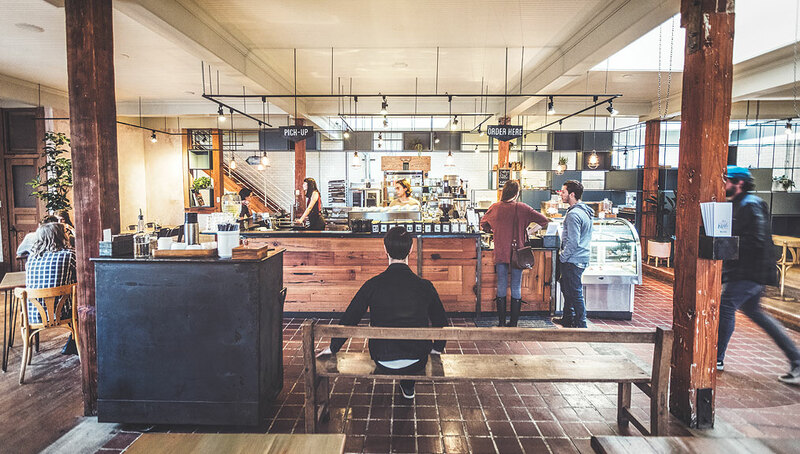 2)Baristas Up Front: Customers order and pick up at the bar, where baristas are stationed to prepare drinks, answer questions about the menu, and act as runners for the kitchen. 1) Super Crock: Just out of view is one of the Rose’s soup crocks, used to hot-hold gravy and hollandaise for brunch specials. (Soup crocks are also used for soups, naturally.) Pacheco and Norton teamed up to bring items like Biscuits & Gravy to the menu; Pacheco already had a cheddar-and-herb biscuit in the bakery, so Norton made a gravy to pair. 2) Mise en Place: Most of the ingredients needed for the menu are portioned out in the flip-top refrigerated table. 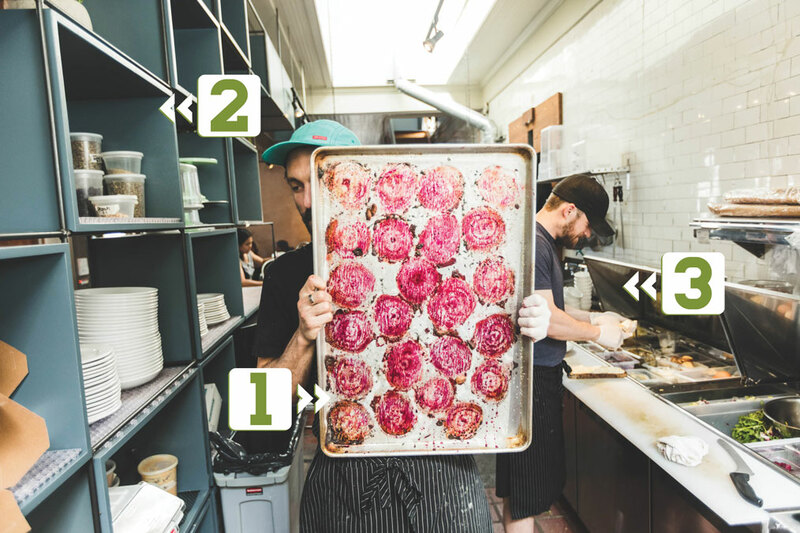 Norton cross-utilizes many ingredients—house-made pickled vegetables, roasted potatoes, soft-boiled turmeric-brined eggs—to make the most of limited fridge space. 1) Beets Me: Casey holds a beet-covered sheet pan (beets are marinated in the shops leftover batch brew). The Rose lacks a commercial stove, so much of the shop’s roasting is done using the oven, while simmering is accomplished with portable induction burners. 2) Two-Faced Storage: Another look at the Rose’s modular shelf units. Back-of-house shelves near the line store plates, dry ingredients, and to-go boxes. 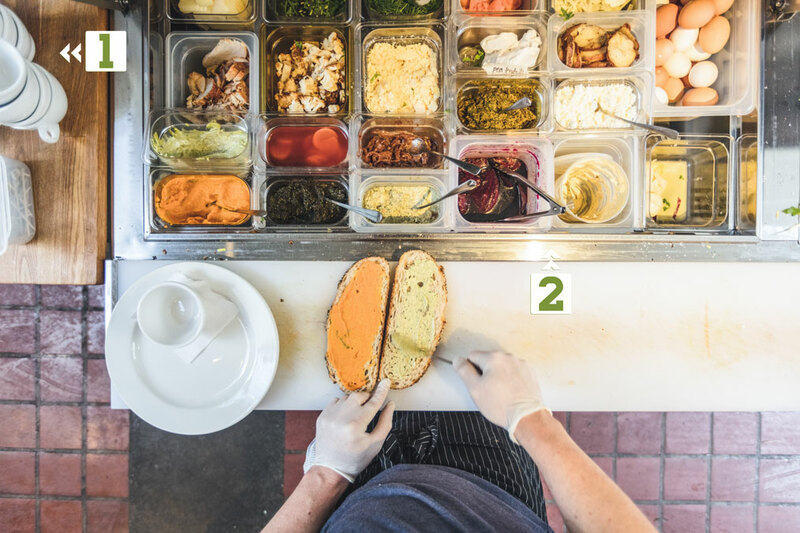 3) Line Logistics: Nate works on the line, where all brunch and lunch dishes are assembled to order. 1) Sweetly Sequestered: Shelves in the bakery prep area house some of Pacheco’s secret bakery ingredients, including cocktail bitters, extracts, and candied flowers. 2) Pea Shoots, Pea Scores: In addition to letting in light, the open shelves allow for easy communication with baristas and food runners, and prevent claustrophobia in the tight workspace. They also make a great space to house the plants Norton grows as ingredients and garnishes, including pea shoots, spouts, and microgreens. 1) Local Flavor: The blue shelves seem to hold everything, including local chocolate from Amano and Solstice, used in baked goods and mochas. 2) Roll with It: Butcher block–topped prep tables roll where they’re needed and provide additional options for storage. 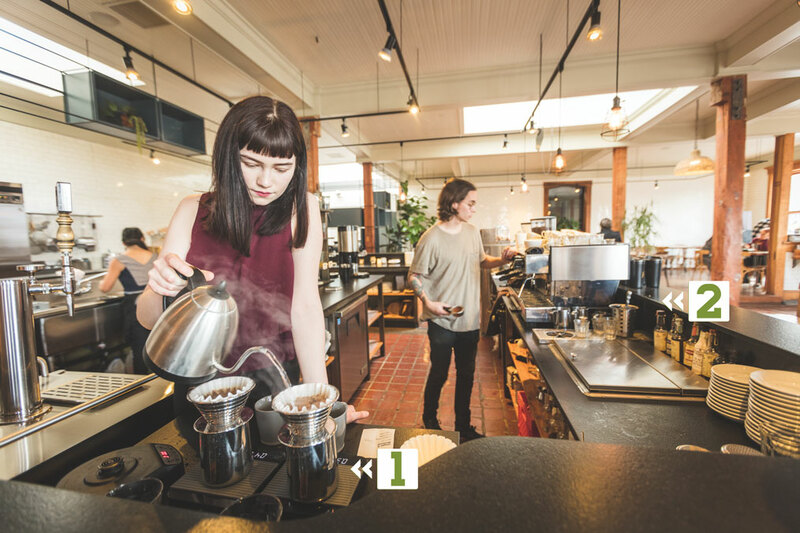 1) Duck, Duck, Gooseneck: A digital Bonavita variable temperature kettle is used on the manual brew bar alongside a pair of Kalita Wave drippers. The electric kettle frees up induction burners for use in the kitchen. 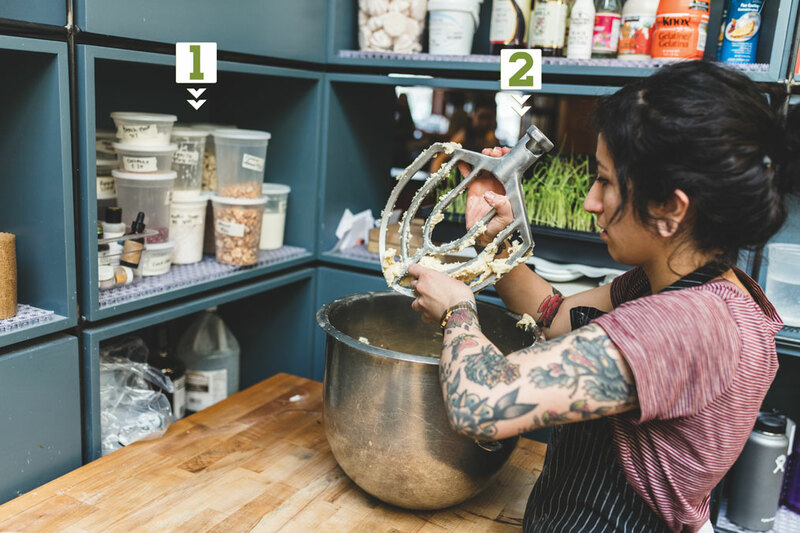 2) Innovative Ingredients: Beverage prep remains the most visible behind-bar activity at the Rose. An ever-changing list of signature drinks features house-made bitters, sodas, and syrups—many of which have been crafted by repurposing food menu ingredients.